The 2000 American Platinum Eagle Coins realized drastic drops in demand for the bullion strikes with the Proof Eagles also showing a decline. The most likely factor in the decreased interest for the bullion Eagles is the fact that the Platinum market showed strong gains during the year. The precious metal averaged only $377.93 the year before, but grew to an annual average of $544.03 by the end of 2000. Proof Platinum Eagles continued their tradition of a new annual reverse design with the third of five images in a series entitled "Vistas of Liberty." The 2000 coin reverse showed a bald eagle flying above a field in the midwest of the United States. 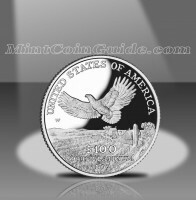 For the second consecutive year, Bullion Platinum Eagles showed a decline in their total mintage. In fact, the 2000 mintage only represented a mere 45% of what had been struck the year before. 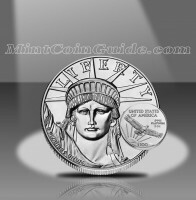 Proof Platinum Eagle mintage also dropped for the year. Hardest hit for these strikes was the 1/10 ounce Proof which lost 3,482 coins from the previous year’s mintage. The chart below shows the total mintage of 2000-dated Proof Platinum Eagles which includes the number sold as part of the Platinum Eagle 4-Coin Set (of which 8,535 were sold). The 2000 Platinum Eagles marked the fourth year for the series of coins from the United States Mint. Bullion Platinum Eagles were available through the Mint’s network of authorized purchasers for most of the year. Proof Eagles were not released until September – much later than typical for the Mint. The Mint sold the Bullion Platinum Eagles through its network of authorized purchasers for a small premium above the current spot price of platinum. Proof Platinum Eagle prices were raised by the Mint to $740 for the One Ounce Proof, $405 for the 1/2 Ounce Proof, $227 for the 1/4 Ounce Proof, $118 for the 1/10 Ounce Proof and $1,375 for the 4-Coin Set. Al Maletsky designed the reverse of the Proof Platinum Eagles. It featured an eagle soaring above a midwestern field. It marks the third of five annual designs in the "Vistas of Liberty" series. A ‘W’ mintmark on the proof coins indicate they were struck at the US Mint’s facility in West Point. John Mercanti’s "Portrait of Liberty" is shown on the obverse (heads side) of all of the Platinum Eagles. Thomas D. Rogers Sr.’s "Soaring Bald Eagle"is shown on the reverse (tails side) of the bullion Eagles. The Proof Eagles show a bald eagle flying above a field in the midwest. It was designed by Al Maletsky.